Patheon’s announcement this week that it plans to file for an initial public offering (IPO) is the latest move by the company, which has been actively building its capabilities through targeted acquisitions. So what is the impact on the pharma outsourcing market? Patheon’s decision to file for an initial public offering (IPO) follows a series of acquisitions for the company to expand its core strength in pharmaceutical development and drug product manufacturing services as well as add capabilities in drug substance development and manufacturing, both biologics and small molelcules to become an end-to-end contract services provider. So what are the implications for the pharma outsourcing market and what are the company’s key strategic initiatives? DCAT Value Chain Insights (VCI) examines the issues. Patheon filed a registration statement (Form S-1) with the US Securities and Exchange Commission (SEC) relating to the proposed IPO of its common stock. The number of shares to be offered and the price range for the offering have not yet been determined. J.P. Morgan, Morgan Stanley, Jefferies, and UBS will act as joint book-running managers for the proposed offering. Patheon’s decision to file for an IPO follows a series of acquisitions for the company to expand its pharmaceutical development and drug product manufacturing services as well as to add capabilities in drug substance development and manufacturing, both biologics and small molelcules to become an end-to-end contract service provider. The key deal was the formation of DPx Holdings B.V., privately owned by the private-equity firm JLL Partners (51%) and Royal DSM (49%), which was the result of a $2.65-billion deal between the two entities, first announced in November 2013 and completed in March 2014. JLL contributed $500 million in equity to DPx Holdings B.V., and DSM contributed DSM Pharmaceutical Products and received approximately $115 million in cash and $75 million of preferred partnerships interest, thereby valuing DSM Pharmaceutical Products at $670 million. DPx Holdings B.V. then effected a Plan of Arrangement pursuant to the Canada Business Corporations Act with Patheon under which DPx Holdings B.V. acquired Patheon for approximately $1.98 billion and a combined deal value of $2.65 billion. Taken from the Patheon perspective alone, since 2012, the company has invested $1.4 billion to acquire five companies: Banner Pharmacaps, DSM Pharmaceutical Products, Gallus BioPharmaceuticals, Agere Pharmaceuticals, and IRIX Pharmaceuticals. The IRIX and Agere acquisitions are the company’s two latest acquisitions, both closing in 2015. IRIX Pharmaceuticals, a Florence, South Carolina-headquartered company,specializes in making difficult-to-manufacture active pharmaceutical ingredients (APIs) for drugs from early and late development, through commercial launch. With the acquisition, Patheon secured additional API development and manufacturing services in the US, including high-potency (SafeBridge Class IV certified) and controlled substances (Schedule 1-4) and commercial API manufacturing at sites in Greenville and Florence, South Carolina. Also in 2015, Patheon acquired Agere Pharmaceuticals, a privately held contract development and manufacturing organization (CDMO), headquartered in Bend, Oregon, specializing in solubilization technologies and related science to improve the bioavailability of drugs. The acquisition of Gallus BioPharmaceuticals,, a contract manufacturing company specializing in biologics, was completed in Septemer 2014, and provided Patheon with US-based biologic drug substance sites in the US and complemented Patheon’s two existing sites in Groningen, the Netherlands and Brisbane, Australia, which the company secured through the DSM transaction. Banner Life Sciences, which Patheon acquired in 2012 (then called Banner Pharmacaps), provided the company with proprietary products and technology primarily based on soft gelatin capsules. Patheon posted 2014 revenues (fiscal year ending October 31, 2014) of $1.7 billion and a net loss of $119 million (historical basis) and on a pro forma basis, revenues of .$1.98 billion and a net loss of $315 million.The US and Europe are the company’s largest geographic markets, respectively representing 55% and 37% of revenues, based on first-quarter fiscal year 2015 revenues. The company employs approximately 8,700 people at more than 25 locations in the US, Canada, Europe, Australia, Japan, and China. The company’s business has four main business segments (see Table I). Drug Product Services (DPS), which provides manufacturing and packaging for approved prescription, over-the-counter, and nutritional products, accounted for 60% of the company’s total revenues in fiscal 2014. DPS operations are located at 11 facilities in North America and Europe. 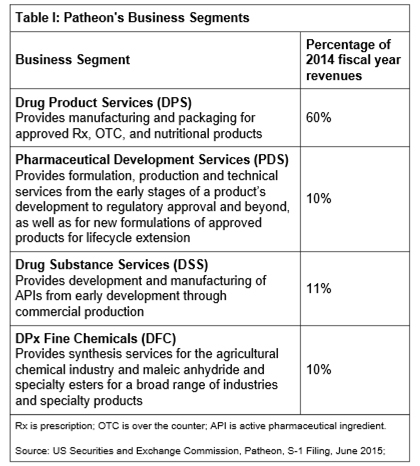 Pharmaceutical Development Services (PDS), which provides a wide spectrum of advanced formulation, production and technical services from the early stages of a product’s development to regulatory approval and beyond, as well as for new formulations of approved products for lifecycle extension, accounted for 10% of the company’s total revenues in fiscal 2014. The company operates nine development facilities in North America and Europe. Drug Substance Services (DSS), which provides development and manufacturing for the biologically active component of a pharmaceutical product from early development through commercial production, accounted for 11% of the company’s total revenues in fiscal 2014. The company operates two small-molecule active pharmaceutical production facilities, located in Linz, Austria and Regensburg, Germany, and four biologics active drug substance development and manufacturing facilities, located in: St. Louis, Missouri; Princeton, New Jersey; Groningen, The Netherlands; and Brisbane, Australia. DPx Fine Chemicals (DFC), which provides synthesis services to customers in the agricultural chemical industry and maleic anhydride and many specialty esters used in a broad range of industries and specialty products, accounted for 10% of the company’s total revenues in fiscal 2014. According to the company’s S-1 filling, the company provides development and manufacturing services for more than 800 products and molecules and produces 24 billion solid doses and 150 million sterile doses annually.Over the last decade, the company has developed and manufactured 86 newly approved drugs, including 11 in 2014. Patheon says this represents 41% of the total outsourced approvals during this period. It has a customer base of 400 significant customers in over 60 countries, including all of the top 20 largest pharmaceutical companies, seven of the 10 largest biotechnology companies. and seven of the world’s 10 largest specialty pharmaceutical companies, according to the company’s S-filing. Over the last three years, 33% of the company’s commercial manufacturing new product launches originated from its formulation and development projects. Since 2013, of the 27 PDS projects that received regulatory approval, 74% remained with Patheon for commercial manufacturing. The company noted in its S-1 filing that drug-product commercial manufacturing contracts generally extend five or more years, and at least 90% of the products it currently manufactures are under contract through 2017. In fiscal 2014, the company had PDS projects for 618 drugs in clinical development, including 235 Phase I projects, 110 Phase II projects, and 203 Phase III projects. The company says that its formulation. and manufacturing services encompass 75% of the all pharmaceutical dosage forms and specialized capabilities, such as high potency, controlled substances, low-solubility, aseptic manufacturing, modified release and softgel formulations, are of increasing importance. On the manufacturing front over 2014 and 2013, to improve profitability, the company restructured its Puerto Rican operations as part of its efforts to eliminate operating losses and develop a long-term plan for itsbusiness in early 2014 and announced the closure of its facility in Venlo, The Netherlands in July 2014. As part of those restructuring efforts, the company incurred $53.5 million in repositioning expenses in fiscal 2014 that related to the DPP integration activities, the shutdown of the Venlo, The Netherlands and Caguas, Puerto Rico facilities, reduction of workforce at its Swindon, UK facility, outsourcing of certain back-office functions, and other operational initiatives. In fiscal 2013, the company incurred $15.8 million in repositioning expenses, of which $5.2 million related to the closure of the Olds, Alberta, Canada facility that was acquired as part of the Banner Acquisition and the shutdown of the Caguas, Puerto Rico facility, with the remainder related to the plan of termination associated with the Swindon, UK facility. Table II outlines the company’s principal facilities. The decision by Patheon to go public follows another important IPO in 2014 that of Catalent Inc., the parent company of Catalent Pharma Solutions, and in 2015, a secondary follow-on offering, the proceeds of which were to be used in part to fund ongoing expansions. Examples of recent investments by the Catalent include new facilities for the company’s softgel and clinical supply businesses in China and Brazil, a new $20-million Biologics Center of Excellence for cell-line development and biomanufacturing in Madison, Wisconsin, and a $35-million ongoing expansion in the company’s Oral Advanced Technologies manufacturing site in Winchester, Kentucky. The company also acquired Redwood Bioscience Inc., which included the SMARTag Antibody-Drug Conjugate (ADC) technology platform. Other investments announced by Catalent in 2014 included: plans to install new automated prefilled syringe clinical packaging lines at its Philadelphia Clinical Supply Center of Excellence; plans for a dedicated laboratory at its Kakegawa, Japan site to provide proof-of-concept support and feasibility studies for Catalent’s proprietary Zydis Orally Dispersible Tablet (ODT) technology; and an expansion of manufacturing capacity for its OptiGel Micro softgel technology. Also in 2014, Catalent acquired Micron Technologies, a provider of particle-size engineering technologies and announced an expansion of its highly potent and cytotoxic clinical drug packaging capabilities at its facility in Kansas City, Missouri. Earlier in 2015, Catalent Pharma Solutions announced an expansion of European Clinical Supply Services network relating to specialty clinical packaging for highly potent or temperature-sensitive products. The company is also is expanding its potent handling and manufacturing capabilities at its facility in Somerset, New Jersey. The company also added new coating and blister packaging equipment at its softgel manufacturing facility in Eberbach, Germany. Coating services were scheduled to be operational in early 2015, with the packaging equipment expected to be on line in the middle of the calendar year. Also in 2015, Catalent Pharma Solutions acquired Pharmapak Technologies Pty Ltd., a pharmaceutical packaging business based in New South Wales, Australia. Several companies announced expansions in 2015 and 2014 in formulation services and drug product manufacturing .In 2015, Piramal Enterprises Limited invested $30.65 million toward acquiring Coldstream Laboratories Inc., a CDMO focused on the development and manufacturing of sterile injectable products and based in Lexington, Kentucky. Earlier this year, Dr. Reddy’s Custom Pharmaceutical Services (CPS) division expanded its existing custom service facilities with a new formulation development laboratory in Miyapur, Hyderabad, India. The move brings together the existing API development team and the formulation teams at one location. With this expansion, the laboratories will form a Center of Excellence for fully integrated API and formulation development services, including pre-formulation studies, prototype formulation development, process development, and optimization. These development capabilities will integrate CPS’ offerings of cGMP supplies for clinical trials, registration batches, and commercial manufacture. Earlier this year, Pharmaceutics International, Inc. (Pii), a CDMO based in Hunt Valley, Maryland, completed the expansion of its manufacturing facility. This expansion, together with the purchase of new 300-L fluid beds for solvent coating, is in preparation for future commercial approvals. In addition, Pii’s UK subsidiary, Pharmaterials, added 11 new manufacturing suites for the European market. Pii also announced an expansion of its commercial packaging capabilities. Xcelience, a CDMO based in Tampa, Florida, announced an expansion of its manufacturing facilities with a 6,000 square foot expansion and expansion of its pharmaceutical development labs in a new 71,000-square foot headquarters in Tampa to support future company growth. Xcelience provides preformulation, formulation development, analytical services, GMP manufacturing, small-scale commercial manufacturing, and global clinical supplies packaging and logistics. In 2015, Recipharm, a CDMO based in based in Jordbro, Sweden, made an equity investment in Synthonics Inc. a drug-delivery company and formed a strategic alliance with Adroit Science AB under which Adroit will support Recipharm’s pharmaceutical development with solid-state characterization services. In 2014, Recipharm completed its acquisition of Milan-based Corvette Pharmaceutical Services Group from the Italian private equity Group LBO Italia Investimenti s.r.l. for EUR 120 million ($160 million) in 2014. Corvette Pharmaceutical Services Group (consisting of Corvette Group SpA and LIO Immobiliare s.r.l.) has three manufacturing facilities located in the Milan region of northern Italy. The Masate site has a sterile injectable manufacturing facility with capabilities for both lyophilization and liquid filling of vials and ampuls, including hormones. The Paderno Dugnano site has an API and finished dose form development and manufacturing facility with a number of owned product rights, including erdosteine, an important mucolytic product.The Lainate offers bulk lyophilization of sterile beta-lactam antibiotics supplied to numerous markets. Also, in 2014, Recipharm later acquired Flamel Technologies SA facility located in Pessac, France and Lusomedicamenta, a CDMO based in Lisbon, Portugal. Other key acquisitions occured In 2014. To strengthen its position in sterile filling, Siegfried Group agreed to acquire Hameln Pharma, consisting of Hameln Pharmaceuticals GmbH and Hameln RDS GmbH, for approximately CHF 60 million ($62 million) .AMRI acquired OsoBio, a manufacturer of injectable drug products.. The acquisition enabled AMRI to provide sterile fill/finish services from Phase I development to commercial supply. OsoBio is located in Albuquerque, New Mexico. Its core capabilities include liquid fill and lyophilized products, highly potent compounds, cytotoxics, proteins and peptides, monoclonal antibodies, vaccines, liposomal suspensions, and controlled substances. Earlier this year, Aptuit divested its aseptic clinical manufacturing site in Glasgow, UK to AMRI and entered into a definitive agreement with AMRI for AMRI to acquire Aptuit’s West Lafayette, Indiana solid-state chemistry business for a total consideration of $60 million. In November 2014, Consort Medical acquired the CDMO Aesica Pharmaceuticals Limited for £230 million ($373 million). Consort Medical is focused on developing and manufacturing disposable medical devices for drug delivery, including inhaled, nasal and injectables products through its core operating division Bespak. Aesica provides contract development and manufacturing services for finished dose and APIs. In 2014, Aesica validated its new high-capacity manufacturing facility following a $45-million investment at its Queenborough, United Kingdom site. With the completion of this new facility, Aesica expanded the commercial production of a solid dose medication used in treating Type 2 diabetes in adults. The purpose-built facility is capable of producing in excess of 1 billion tablets per annum and was designed with future expansion in mind. It is expected the facility will more than double its current capacity to produce over 2.5 billion tablets per year on expansion.. Also in 2014, Aesica Pharmaceuticals added additional services in its oral solids capability, including a new roller compaction unit for dry granulation production in Zwickau, Germany. The investment complements other recent investments in the region, including a new tablet coater capability and pouch packing line. In 2014, Xellia Pharmaceuticals acquired Fresenius Kabi’s lyophilized vial manufacturing facility in Raleigh, North Carolina. The deal included a continuous manufacturing and supply agreement with Fresenius Kabi USA. The manufacturing site is located close to Research Triangle Park and is Xellia’s first facility in the US and expanded the company’s manufacturing capacity for injectable pharmaceutical products. The move reflects Xellia’s strategy to add capabilities in supplying finished dosage forms. in addition to its expertise in supplying APIs. The acquisition is part of the latest phase of Xellia’s ongoing global expansion plans, which included an investment of $2 million at the company’s Product and Innovation R&D Center of Excellence in Zagreb, Croatia in 2014. Other companies announced investments in 2014, DPT Laboratories, a CDMO focused on semi-solid and liquid dosage forms, acquired Meda Pharmaceuticals’ Lakewood, New Jersey facilities. The acquisition expanded DPT’s footprint in Lakewood by adding two buildings totaling 90,000 square feet of space, which include additional cold storage and a larger analytical laboratory. As part of the acquisition, DPT absored Meda Pharmaceuticals’ employees to continue the manufacturing of MUSE (alprostadil), an urethral suppository product. Meda Pharmaceuticals Inc. is the US subsidiary of the Solna, Sweden-based pharmaceutical company Meda AB. In November 2014, DPT also expanded its high-speed bottle filling center at its San Antonio facility. One of three DPT Centers of Excellence, the San Antonio location is purpose-built for semi-solids and liquids to support pharmaceutical manufacturing. The new high-speed bottle filling center provides large-scale production capacity. Rottendorf Pharma GmbH, a CDMO specializing in solid dosage formulation, manufacturing, and packaging, headquartered in Ennigerloh, Germany, invested EUR 10 million ($10.8 million) in a new development center in Ennigerloh, Germany, which became operational in 2009, added a new GMP pilot plant for small-scale and submission batches in 2009, and upgraded laboratory facilities in 2014. The company is investing an additional EUR 5 million ($5.4 million) to add granulation and fluid-bed capabilities at its facility in Germany, which are scheduled to be completed in the fourth quarter of 2015. On a technology basis, the company offers specialized services, such as hot-melt extrusion, used to make solid dispersions for poorly water-soluble drugs, and recently added capabilities in hot-melt granulation, a granulation method for improving bioavailability by forming solid dispersions. The company is also evaluating adding additional capabilities in high-potency manufacturing. In 2011, the company established a US subsidiary, Rottendorf Pharmaceuticals, based in Chicago and headed by CEO Gordon Haines. Cirrus Pharmaceuticals, a Kemwell company, which provides pharmaceutical contract development and manufacturing services, invested in a flexible cGMP suite in its facility in Research Triangle Park, North Carolina for cGMP manufacturing services for many dosage forms, including oral solids as well as inhalation, liquids, and topicals. Also, Aptuit added hot-melt extrusion (HME) technology for processing poorly soluble drugs. The addition of the HME technology complemented the company’s existing micronization, wet-bead nanomilling, and spray-drying capabilities, as technologies for improving processing of poorly soluble drugs. In 2014, Metrics Contract Services, a CDMO based in Greenville, North Carolina, expanded its capabilities in spraying drying for use in improving drug bioavailability. Metrics also invested $1.6-million for a new laboratory to support pre-clinical development of early formulation prototypes and related analytical methods. It also added roller compaction equipment for small-scale production at its Greenville site. In June 2014, Bend Research, a division of Capsugel Dosage Form Solutions, installed a commercial-scale spray dryer in its R&D facility in Bend, Oregon.. The installation coincides with ongoing construction to expand the cGMP commercial facility, which includes an additional commercial-scale spray dryer for production of late-stage clinical, launch, and commercial spray-dried products. Also in 2014, Capsugel launched lipid multiparticulate (LMP) technology based on melt-spray congeal (MSC) processing to combine the benefits of lipid-based formulations (LBF) with the functionality of a multiparticulate dosage form in one offering. MSC processing for LMP production is available at Capsugel’s manufacturing site in Bend and a commercial-scale facility with MSC processing and capsule-filling capability was recently installed at its facility in Greenwood, South Carolina. In 2014, Almac expanded its UK commercial packaging facility to provide a humidity-controlled blister packaging suite, complete with off-line “just-in-time” blister printing. The company also is investing more than £54 million ($90 million) over the next several years to expand staffing at two operating business units, Pharma Services, which provides contract development and manufacturing services, and Clinical Services, which provides clinical packaging, labeling, logistics, and clinical supply-chain management services. In 2014, Packaging Coordinators, Inc. (PCI), a provider of packaging solutions, added to its capabilities with the acquisition of Penn Pharmaceutical Services Limited (Penn Pharma), a CDMO headquartered in Tredegar, Wales, Penn Pharma offers drug-development and manufacturing services, including clinical and commercial dosage form manufacturing, as well as clinical packaging, labeling, and global storage, distribution and return drug services.